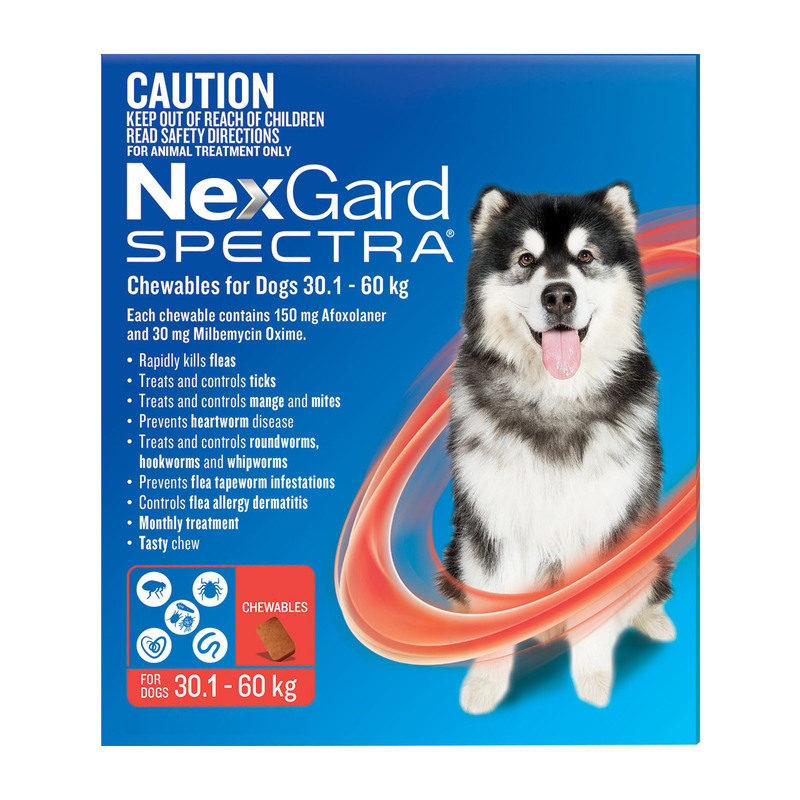 Nexgard for Dogs offers a month-long protection against fleas and ticks. The soft flavoured chews kill both fleas and ticks. It destroys ticks especially Paralysis ticks, Brown dog ticks and bush ticks. 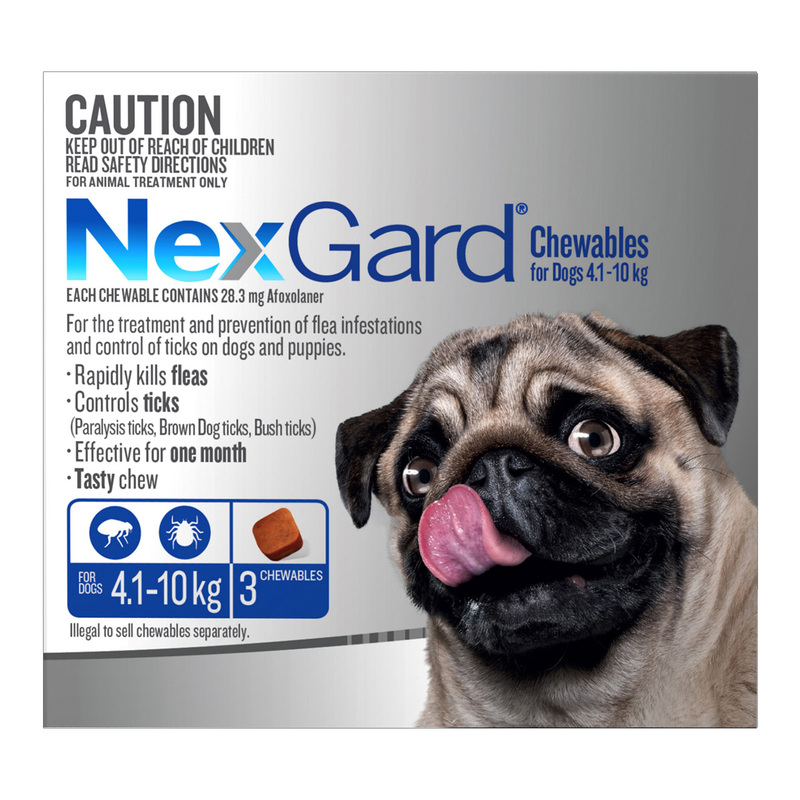 NexGard kills adult fleas and ticks. The advanced formula is also indicated for the control of mites and flea tapeworm infestations. 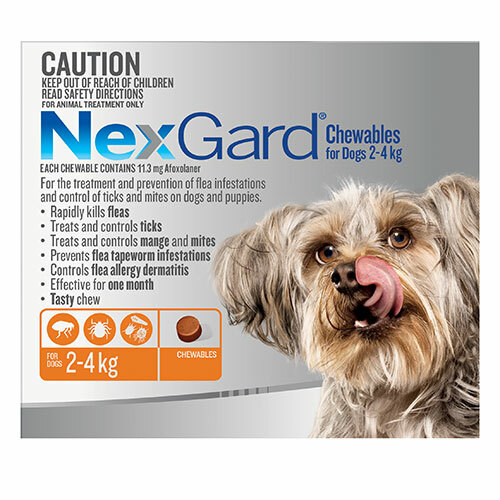 Nexgard chewables are also effective against demodectic mange (caused by Demodex spp. ), sarcoptic mange (caused by Sarcoptes scabiei), and otodectic mange (caused by Otodectes cynotis). It is helpful for the treatment and prevention of flea infestations and for the control of newly acquired adult fleas. Nexgard contains afoxolaner as the active ingredient. Afoxolaner keeps releasing for one continuous month. It creates hyper excitation in the central nervous system of fleas and ticks, and destroys them. The continued activity for 30 days prevents any chances of re-infestations. Additionally, flea tapeworm infestation is prevented by the action of afoxolaner on the primary intermediate host, the flea. The active ingredient rapidly kills fleas, which effectively prevents maturation of the immature stage of tapeworms, and thereby prevents flea tapeworm infestations in dogs. The treatment is highly effective for Paralysis ticks, Brown dog ticks and Bush ticks. The flavoured chewable reduces flea egg production and flea population. It is safe to use on puppies from 8 weeks of age. 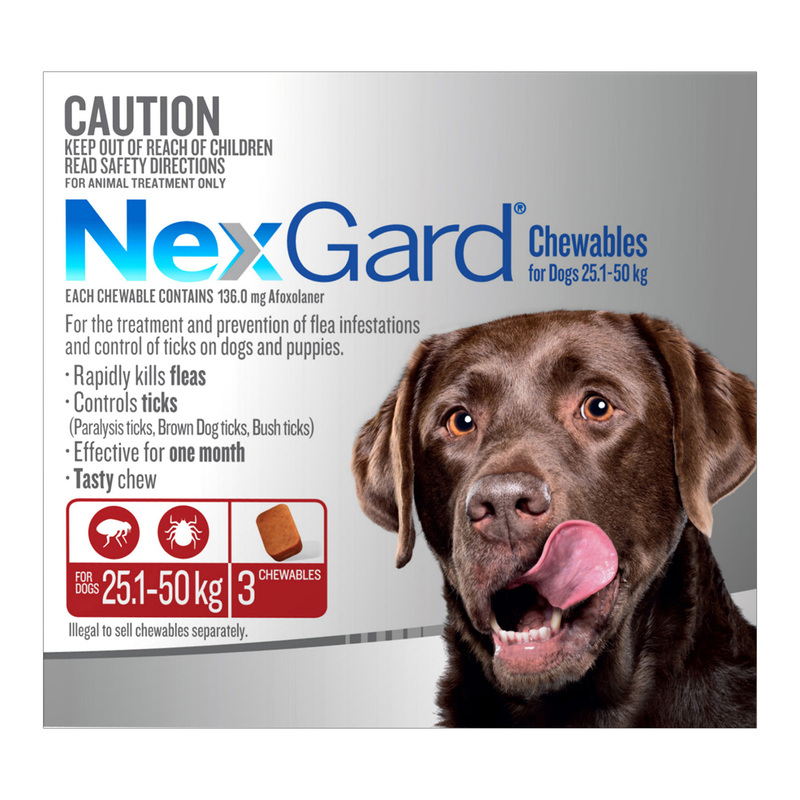 The dosage of Nexgard for dogs varies in accordance with the weight of the canine. 2.7-6.9 mg/Kg body weight is the recommended dosage. These chewable tablets are available in four different packs marked by different colours. Refer dosage table for details. To administer, put the tablet directly in the pet’s mouth. If the dog resists then you can mix with his food. In this case, make sure that the pet completes his meal so as to intake the entire dosage. Repeat after 30 days (one month), precisely on the same date. 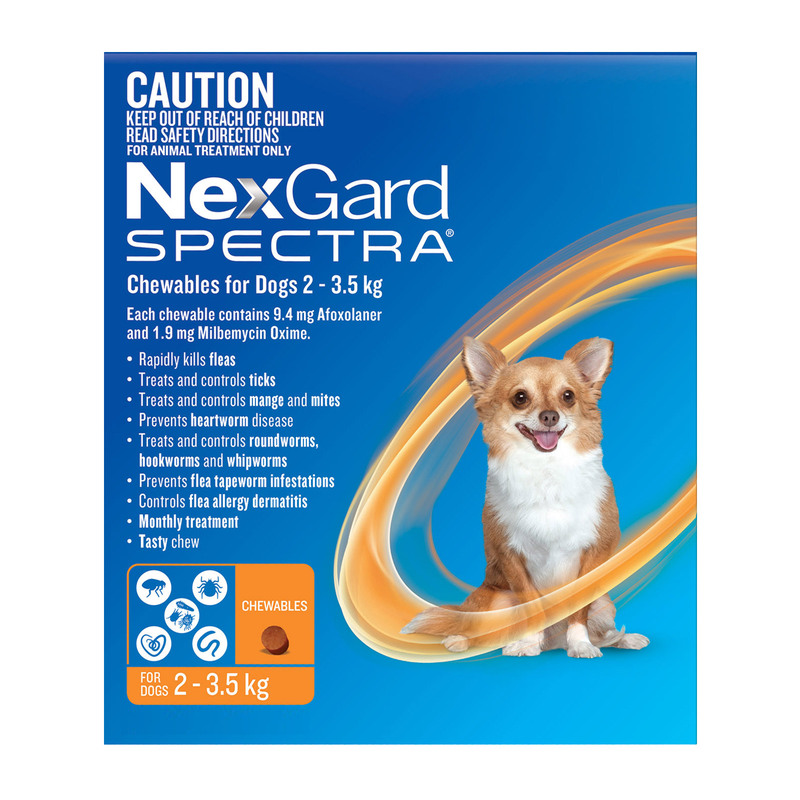 Note:- Safety of Nexgard in breeding, pregnant and lactating dogs has not been approved. So, follow your vet’s advice if your pet is in any of these stages. It is easy to administer as beef flavoured chew is taken as a treat by pets. Compared to spot-on treatments, it is mess free as there are no chances of residue, staining or discolouration of the pet’s skin. It starts working within 8 hours and thus is a rapid acting treatment for dogs. It controls various ticks and prevents flea infestation. 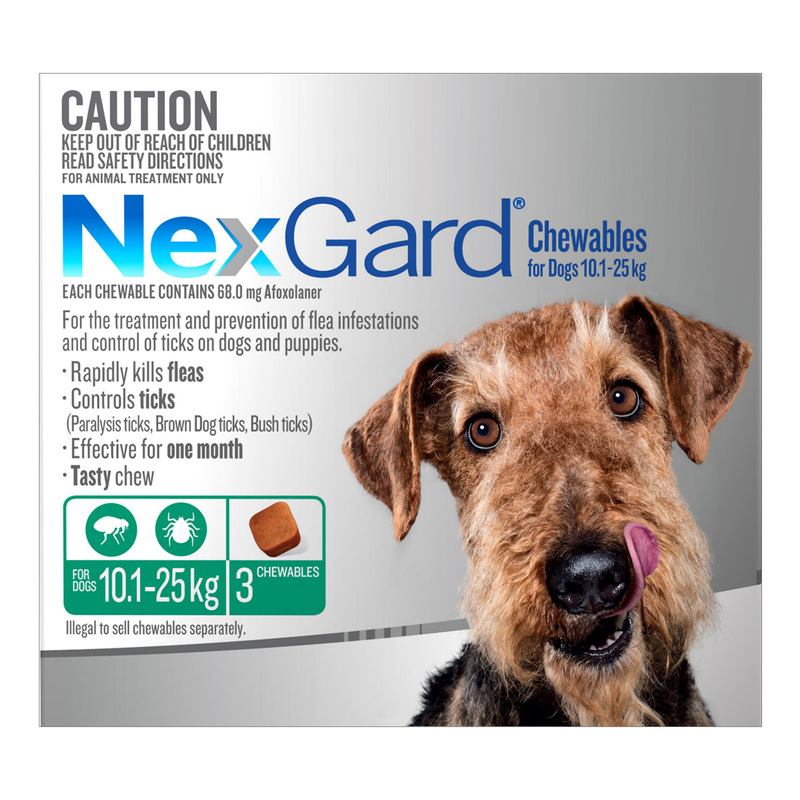 Nexgard is strictly a dog flea and tick treatment. Do not administer it to any other species of pets. 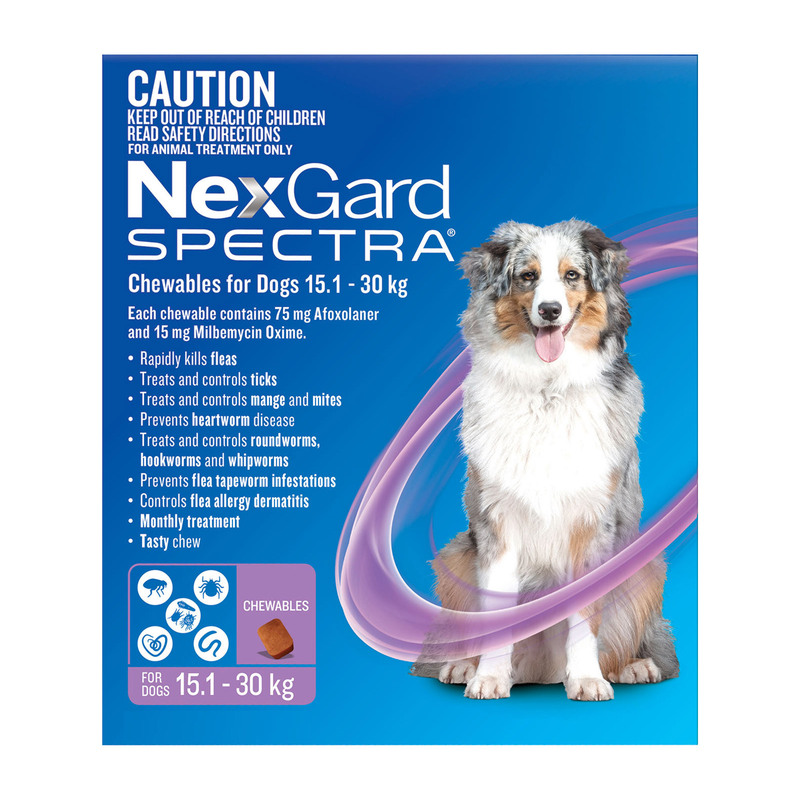 In case, the pet has a history of epilepsy or seizures then vet advice prior to buying Nexgard is a must. Follow the label instructions to get details about administration, expiry date, dosage and precautions. Adverse reactions are rare but may be observed in hypersensitive pets. If your pet shows symptoms like vomiting, appetite loss, lethargy, flaky skin, diarrhea etc. then consult a vet immediately. Wash hands with soap and water after giving the chewable to the pet. 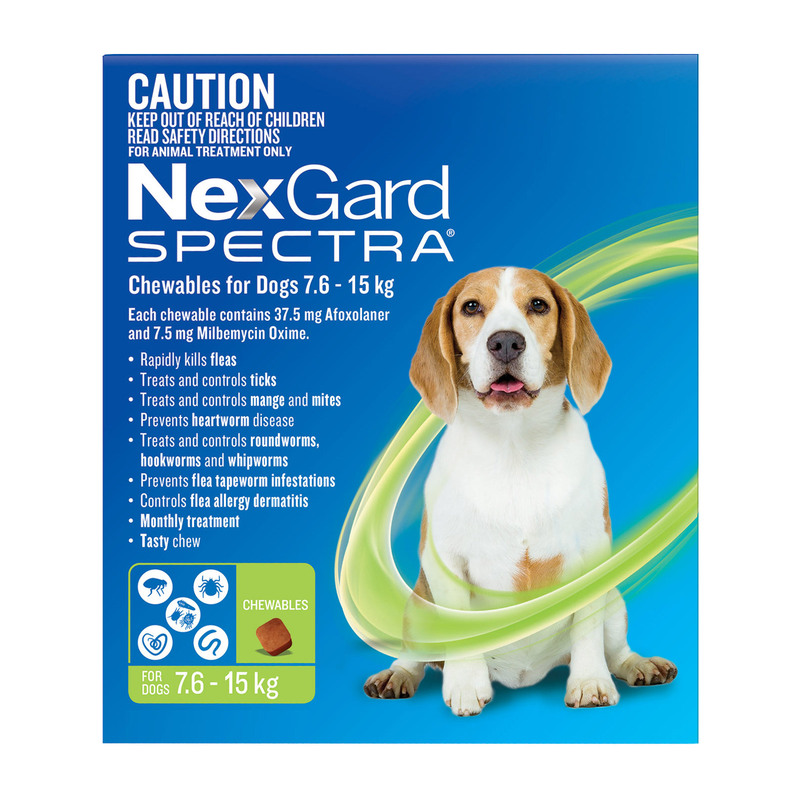 Do not give to pets allergic to any of the ingredients of Nexgard. My dog takes it without creating any fuss and it works real quick. 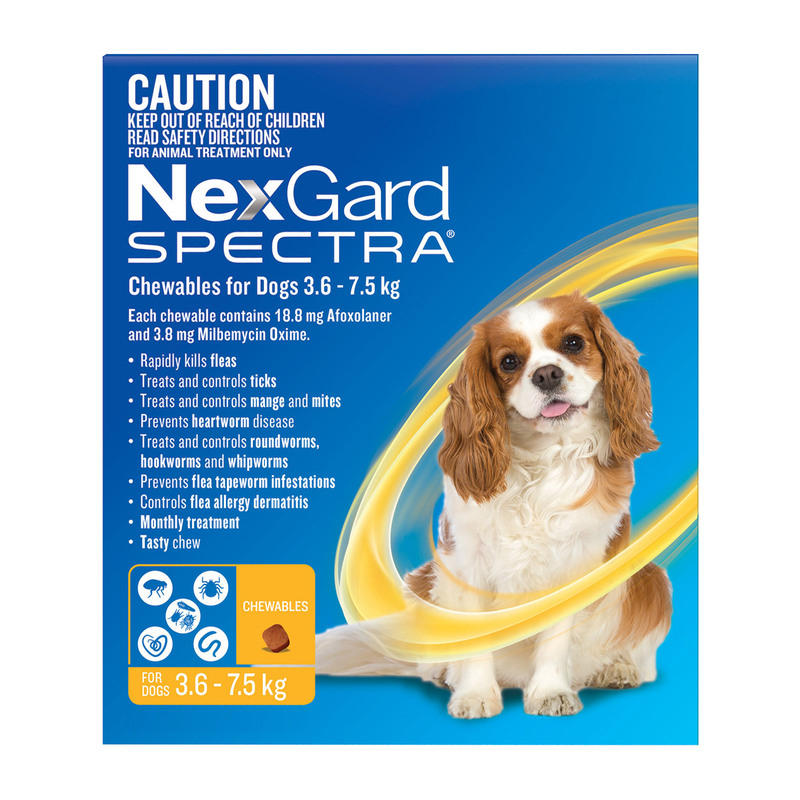 I switched Duke to Nexgard failing on other products and in days I can see him free from flea infestation. Worth it. I don't like applying topical products to my pet's skin because they are generally sticky. Earlier I didn't know about chewables but ever since I have been introduced to Nexgard I love the tablets. They are so easy to feed and you don't have to wait for the treatment to dry out. My dog is very choosy and finicky. It used to become a task for me to give him a tablet. But surprisingly I don't have to chase him for that anymore. He takes it so easily without any reluctance. It is very efficient, not just for keeping fleas at bay but for heartworms and ticks as well.